I’m sharing this inuksuk for those who may find it. It holds meaning and importance. It is created from my own experiences and a moment in time that has importance for me. On the Canadian landscape there are many of these markers. From a deep Inuit tradition, the inuksuk is a symbolic marker left behind to mark a path or share a food resource (Canadian Encyclopedia). Pointing the way toward a safe place or a secure cache of material, these rocky icons now dot the roadsides as you travel the country. It’s a fitting image for this Virtually Connecting event because there’s a secret cache here. Under this marker lies a repository of ideas and thoughts about digital storytelling. These insights were shared by Joe Lambert from his rich experiences and connections over 20 years of working with people telling stories within international contexts. These were responses to questions presented by virtually connected participants in an organized video chat from the 6th International Conference on Digital Storytelling. It was a collaboration between virtual buddies Joe Murphy and myself with support and participation from Maha Bali, Autumm Caines, Sarah S. and Lisa H. along with physical buddies Katie and Jean. Connecting with people involves making sense of diverse thoughts and perspectives. The intention of this conversation was to extend and enhance the conference experience with people who can’t attend the conference physically. This was “not a broadcast but a conversation; not a relationship between star and fan, but between peers” as Maha Bali and Rebecca Hogue write in Beyond Twitter: Virtually Connecting at Conferences. For me, this experience shifted my position from ‘fan’ to ‘peer’ – having a deep conversation with Joe Lambert, a ‘star’ in the digital storytelling sphere. It was a chance to just talk and ramble around with some ideas, experiences and potential with digital storytelling. Deeper threads (ethical practices, humanity, culture, privilege) are woven through the conversation. Joe Lambert shares the importance of facing risks while sharing painful memories in safe and supportive environments. Expertise in counselling and professional caregiving are needed for sensitive stories involving personal health, injury trauma, or violence. Barriers for storytelling can include losing face within a cultural context, losing voice within a society or community, or losing hope within a personal challenge. When the risk is great and the revelations are painful, the story telling is particularly challenging but there is a transformative power – your story telling changes me or clarifies perspectives – thus creating greater understanding. 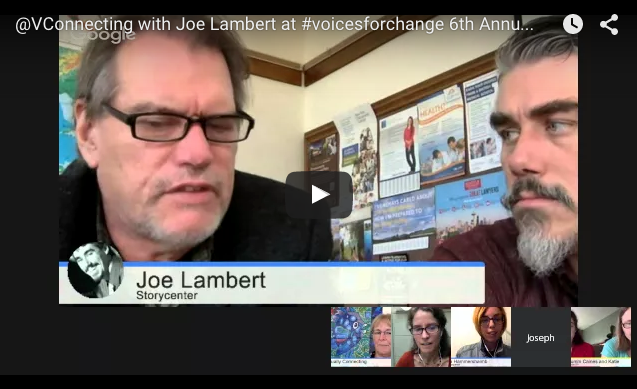 Insights from this Virtually Connecting experience with Joe Lambert – listen deeply, make space for the story to emerge, let silence speak, and honour the voice of the storyteller. Thank you Joe Lambert for sharing time, thoughts, experiences and insights on digital storytelling. 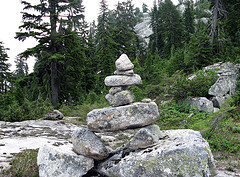 Where do you find ‘inuksuk’ moments – those secret caches of ideas that help you make meaning? Do you mark the space so others can find it? Do you show the way in digital spaces for others to follow? Listen deeply – here’s the full conversation with Joe Lambert.